The device runs apps, acts as a health and fitness tracker and communicates with the iPhone. While smartwatches already exist, experts said Apple had a history of entering sectors relatively late and then changing their direction. Apple also unveiled two new phones, larger than previous ones. The iPhone 6’s screen measures 4.7in (11.9cm) and the iPhone 6 Plus’s 5.5in (14.0cm) – a change that analysts said should help prevent users migrating to Android. It also announced a new service called Apple Pay, which chief executive Tim Cook said he hoped would "replace the wallet" in shops. The Apple Watch comes in two sizes and is controlled by what Apple calls a "digital crown" – a dial on its side that allows content on its screen to be magnified or scrolled through, and can also be pressed inwards to act as a home button. The display is a touchscreen that can detect the difference between a light tap and heavier pressure from the user’s fingers. In addition, the device runs Siri – Apple’s voice-controlled "personal assistant". 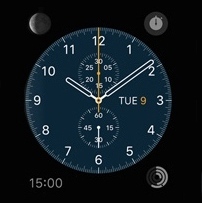 It offers a variety of different watch faces, can alert the user to notifications, act as a heart rate monitor and show maps. Apple said that apps could be processed on an iPhone, but displayed on the watch in order to extend battery life. It did not say how often the device needed to be recharged. Although some of these features are available from competing products, one observer said the device had the potential to ignite the wearable tech sector.